It is with great sadness that the family of Peter Allan Darby of Innisfail, Alberta, announces his passing after a brief illness, on Wednesday, July 11, at the age of 71 years. Peter was born on August 3, 1946 in Nottingham City Hospital located in Sherwood Forest, England, the only son of James Henry and Rosa May Darby. Peter attended an advanced placement secondary school, then graduated from Westminster College, Oxford in the United Kingdom in 1967. He left shortly afterwards to teach in Chikankata Secondary School in Zambia, Africa. It was there that he met his wife, Linda Papsdorf. The two were married July 26, 1969 in Nottingham, England. Peter and Linda moved to Alberta, Canada in 1970, where he continued his education and received a masters degree in geography, eventually settling west of Innisfail where they raised their family in the great outdoors. Peter was a teacher and later vice principal at Didsbury High School. In 1979, he moved to the Innisfail area and became the vice principal, and later the principal at Bowden Grandview School. After working in Bowden, Peter moved to the County of Red Deer Schools central office where he was the director of secondary education, assistant superintendent, and then deputy superintendent of schools. During this time, he also obtained a doctorate degree in educational leadership from Brigham Young University. Peter finished his career working for the Government of Alberta as chair of the School Technology Task Group. After many years serving students and educators, Peter retired in 2001. His talent and skill with technology allowed him to help many with their computer challenges and their family history work. Peter served faithfully in many church callings throughout his life, including bishop of the Innisfail ward. He and his wife, Linda, served a family history mission in Salt Lake City, Utah. Peter also served many years as a part-time Family Search service missionary as well as an area family history advisor. He has shared his knowledge and talent by teaching courses to others and also by planning family history conventions. His love for family history has continued throughout his life and has blessed his own family along with numerous others. Many people have found a great and loyal friend in Peter. He has always been willing to serve and help any in need of assistance, whether it be a ride, a meal, a hug or just a listening ear. He was a wonderful husband, father, and grandfather and will be missed greatly by all— especially his workforce (grandchildren) who will especially miss their payment of pop, their golf games, and eating ice cream for breakfast. He is survived by his wife Linda, his four sons; David (Angela), Paul (Michelle), Mark (Megan), and Andrew (Leah), and his 14 grandchildren; Kaeley, Nathan, Maeghan, Ben, Joshua, Sam, Merrin, Sydney, Tessa, Madeline, Levi, Kallie, Chloe, and Kate. Looks like some very interesting classes – too bad it’s only for a week. This is big news. Legacy Family Tree is an excellent desktop family history product. Unfortunately they never created a version that can be used on a Mac. Now Legacy Family Tree has been “acquired” by MyHeritage – what does this mean? MyHeritage is a large company with over 91 million users. Some people love their website – and inevitably some don’t. I admire their search engine. How might this effect Legacy users? Here is part of their press release and a link to some Frequently Asked Questions. Meanwhile they are offering some great deals on purchases of copies of Legacy Family Tree – see link near the end of this article. We are proud to share with you the biggest step forward we have ever made with our Legacy Family Tree software and our FamilyTreeWebinars.com webinar series. We have entered into an acquisition agreement with MyHeritage, a leading global destination for family history and DNA with 91 million users in 196 countries. The acquisition will provide the resources and cutting edge technologies to advance and expand both our #1 rated software and our #1 rated webinar series. Think Legacy is good now? Watch out future – here we come! Most importantly, you can expect the same high-quality support and service that you have come to expect from us. The entire Legacy and webinar teams will continue on at MyHeritage in our existing roles. Best wishes to everyone involved! I first went to this site on my ipad and that was when I was reminded that I don’t read Ukrainian! Then I used Google Chrome on my computer – and accepted the invitation for translation that appeared at the top of the screen – now I could read what was on the screen! Now I do need to apologize to all my Ukrainian friends . . . your language and alphabet are great! SALT LAKE CITY, UT (26 June 2017)—FamilySearch, a world genealogy leader and nonprofit, announced today its plans to discontinue its 80-year-old microfilm distribution service. The transition is the result of significant progress made in FamilySearch’s microfilm digitization efforts and the obsolescence of microfilm technology. The last day for ordering microfilm will be August 31, 2017. Online access to digital images of the world’s historic records allows FamilySearch to service more people around the globe, faster and more efficiently. See Finding Digital Images of Records on FamilySearch.org and Frequently Asked Questions for additional information. Find and share this announcement online in the FamilySearch Newsroom. Transitioning from microfilm to digital creates a fun opportunity for FamilySearch’s family history center network. Centers will focus on simplified, one-on-one experiences for patrons, and continue to provide access to relevant technology, popular premium subscription services, and restricted digital record collections not available to patrons from home. “the most comprehensive set of British and Irish parish records anywhere. Where have you been, Peter? Taking some time off? While I have taken a break, I have also shifted my efforts from family trees to fallen trees in our yard. After 2 very bad windstorms we have lost over 20 trees – no risk of running out of firewood next winter – or the winter after – or the winter after – and so on! Anyone need any firewood? 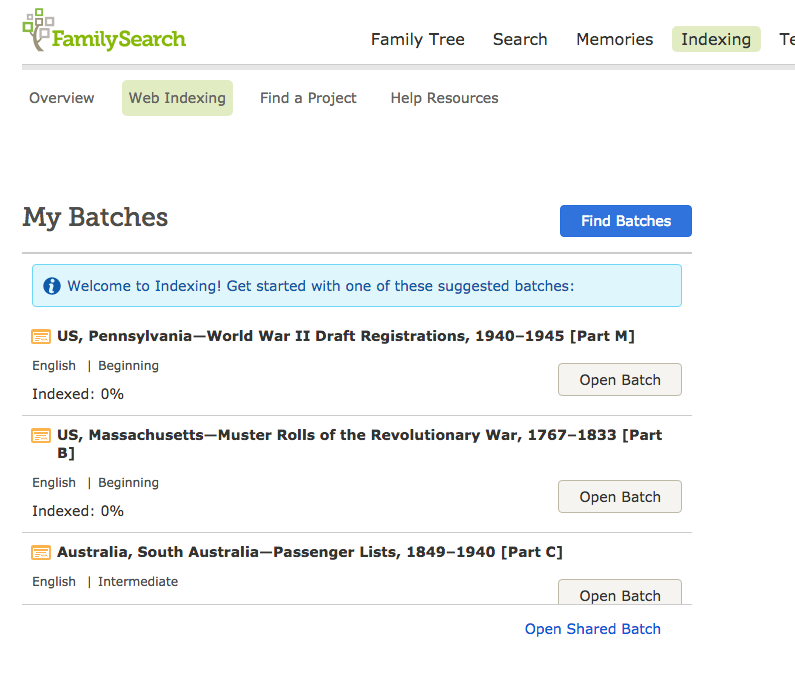 FamilySearch Web Indexing is now available – time to try it! At our recent presentations we asked everyone to try the new FamilySearch Web Indexing, but we told you to wait until it was released – we gave you a holiday! The full public release has happened, but we have waited a while to make sure this new product is stable and ready for you to use. Now is the time for you to try web indexing! Go to familysearch.org and sign in – accounts are free. Then click on Indexing and from the drop down menu select Web Indexing. Carefully read the section My Batches – it suggests that you have 3 batches but the fine print tells you that these are merely suggested batches. Click on the button Find Batches and select a project – you might want to try a Beginner Batch. Hint: It is very important to carefully read the Project instructions – look for the link. Also look for the link to the Field Help. Hovering with your mouse over a menu for more information. If you’re new to indexing or just want to brush up on your skills, take a look at some of the many tools and resources you have at your disposal. Give indexing a try with a quick tour. Take a minute to get familiar with a few important guidelines every indexer should know. With over 100 indexing projects worldwide, you’re sure to find one that interests you. Have questions about indexing in general? We’ve got answers. Check out these valuable resources. There is also a toll free number if you have questions: 1-866-406-1830 and ask for Indexing support. Remember if you can’t read it, you can send it back – there is an option to return batch under the menu Batch at the top of the screen. Please try web indexing – a great way to make more records available for all of us. If you are already an active and regular indexer with the traditional program please continue with the traditional program as there is a lot of work to be done. Projects in the traditional program are different from the projects for web indexing.